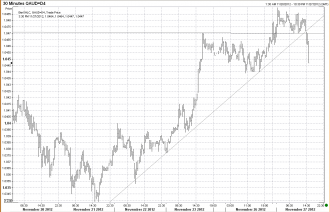 The break back below 1.0470/75 seems to have sent some of the AUD/USD bulls scurrying for the safety of the sidelines. 1.0440 is next support of note for the pair. Offers are seen on rallies now to 1.0470/75. Selling rallies to 1.0470/75 with a stop above 1.0500 for a pullback into the 1.0380/1.0400 area looks like a good risk-reward set-up.